Aaahhhhhhhhhh! 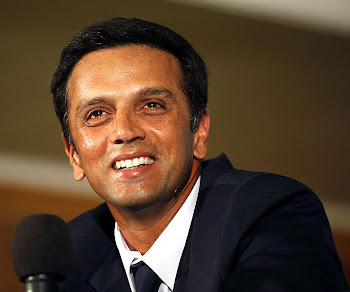 Great news arrives along with the Monsoon.Rahul Dravid has been selected in 30 probables for Champions trophy this September.It is a bit surprising, but nevertheless, it's a great news for all of us. The question remains-why did the selectors turned to the Wall? No wonder, after watching the Indian batsmen sweating over the 'tricky' wickets in absence of Sachin, selectors wanted someone who can take on any attack on any sort of a wicket.The solution was simple- bring back the Wall. After the blow in T20 world cup and a shaky start against WI in ODI series, the eyebrows were raised.Suddenly, people started to criticise MS Dhoni for his poor decision making (that's India for you).Dhoni was wrong is selecting xyz, he was wrong in handing the ball to xyz for 18th over, he was wrong in promoting xyz down the order, and what not? Even though the ODI team includes "talented" players, they need someone who can bat through till the last over.It is a welcome decision to include Rahul in the probables for Champions Trophy.Let's hope that we see our hero in the final 11.
it's very nice. I am very happy today.It is really good for all of us.Though it is late,finely it is owsome. Nice gesture for true gentleman and a world class player of cricketing fraternity!! Dravid will prove what he is! it is a great & good news. now starts the real cricket. Dravid "THE WALL for the World cricket"